Tuesday September 27th 1892 Dr Murphy called for a few moments this morning as he was passing by. We washed and churned in the forenoon besides doing the regular work. Josie went to town in the afternoon. Mother and I brought in the clothes and did some mending. I feel very much better today. weather warm. Wednesday September 28th 1892 We got our ironing done before noon and a good dinner ready. Will took us over town in the surry in the afternoon. I did run about town much. I have such a sore throat I am nearly sick with it. Thursday September 29th 1892 We worked in the fruit some in the forenoon with our other work. My throat is some better today. Mother spent most of the afternoon over to Mrs Seydels. Josie was in town and I sat on the porch to look at Will build side-walk. Ott, Fanny, and Annabel were over to spend the evening. Friday September 30th 1891 We were busy with the work all morning as I did cake baking and put up fruit. Will took us over town in the surry. We took Annabel riding for an hour and then went on to Otts office for a visit. After that we did some shopping before coming home. Will finished paying taxes yesterday. Saturday October 1st 1892 We were busy with the work all forenoon and soon after dinner Mother and I rode down to Robinsons for a little while and on over in town. We got some things for Sunday. I worked in the evening. Will went to town. 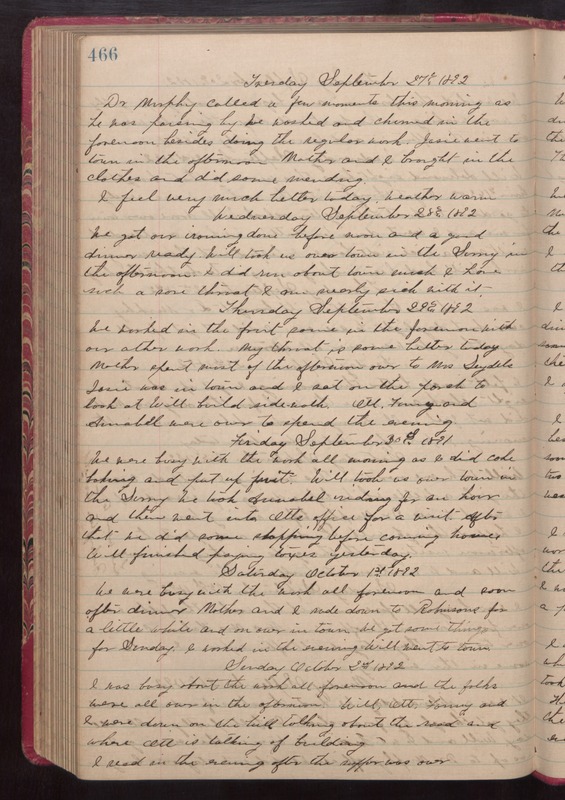 Sunday October 2nd 1892 I was busy about the work all forenoon and the folks were all over in the afternoon. Will, Ott,. Fanny, and I were down on the hill talking about the road and where Ott is talking of building. I read in the evening after the supper was over.